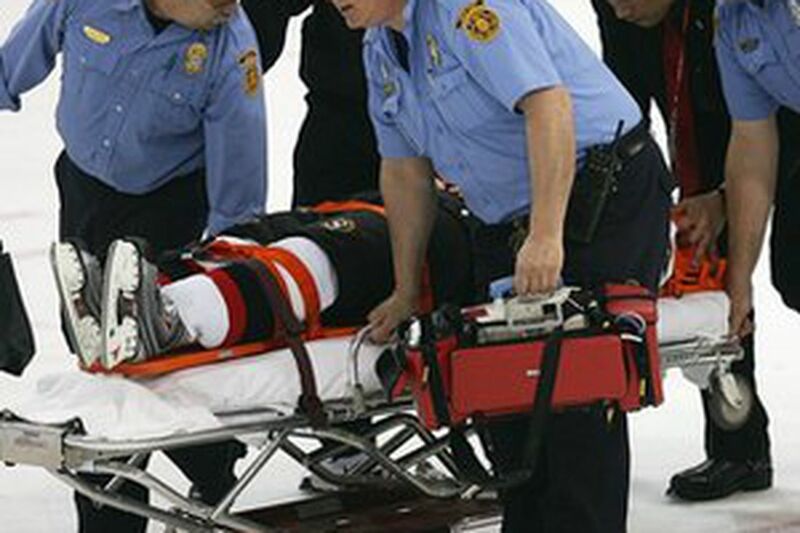 Ottawa's Patrick Eaves is removed from the ice on a stretcher last Sunday after a hit by Pittsburgh's Colby Armstrong that left the winger unconscious and with a concussion. The NHL playoffs are headed toward the second round, and once again we have been reminded of hockey's abject failure to protect the players. When the league's competition committee convenes this summer, head shots will get another review. Early in the Pittsburgh-Ottawa series, Colby Armstrong nailed the Senators' Patrick Eaves with a jarring legal hit to the head. Armstrong is a pit bull on the ice. Even Senators coach Bryan Murray admires his tenacity. "The kid was trying to make contact," Murray told reporters. "[Eaves] had his head down a little bit. He drove with his shoulder. That's part of hockey. I feel real bad with him getting hurt, and I know there will be extensive articles about . . . how that shouldn't be allowed. It was a fair hit, a hockey hit, and we live with that." The hit on Eaves, however legal, left the Senators winger momentarily unconscious and concussed. We've seen this kind of hit repeatedly, going as far back as 2000 when Scott Stevens ended Eric Lindros' career as a Flyer. And still, the rules makers in hockey refuse to address it. We'll say it one more time: the NHL needs to legislate head shots out of the game. Even the clean ones. As usual, commissioner Gary Bettman waffled on the subject during an interview with TSN's James Duthie last week. Among Bettman's remarks: "People get a little too grandiose" in defining head shots. "I find the debate a little fascinating at this point," Bettman told Duthie. "A lot of people over the last year and a half said we took physical contact out of the game when we changed the officiating standard. "We didn't, obviously, from some of the incidents we are seeing and some of the checks we're seeing on the ice. But when a player is heading to the net with the puck and he is bent over, is the defense just supposed to let him go in? I mean, it's a physical game. Players do have a responsibility to be aware of what is going on on the ice." In other words, it's the players' fault. Perhaps the best comment we've seen came from Hall of Famer Bobby Orr, a widely respected former defenseman. Last fall, Orr talked about head shots with TSN's Bob McKenzie. "I don't want to see hitting taken out of the game. I love hitting in hockey," Orr told TSN. "But if someone puts his shoulder into a player's face, if he puts anything - an arm, an elbow, a glove - I think that player should get a penalty. Definitely, it should be a penalty. "We are having players getting knocked unconscious before they even hit the ice and carried off on stretchers. How can that be legal? When did hitting someone in the head with your shoulder or any part of your body become part of the rules? Anything above the neck, it's wrong. "Hey, I got hit a lot when I played, and I didn't get hit in the head with checks. Players didn't always hit like that. To me, that's not part of bodychecking. I mean, don't you have to be responsible for your actions? If you hit a guy in the face with your stick by accident, you're going to get a penalty. "Two minutes, four minutes, five minutes, something. If you go to bodycheck a guy and you hit him in the face or head and injure him, that's legal? That's fair? That's not a penalty? I'm sorry, I don't think that is right. It should be a penalty." There are a growing number of people inside and outside the game who believe it's time for head shots to be banned. It starts with the commissioner taking the lead, not a back seat. No Versus HD (VSGLF channel) again on Monday in much of our area on Comcast, this time, because of technical problems. Hence, we didn't see the Sabres-Islanders game in HD. Pittsburgh had it. Nashville had it. Harrisburg had it. Allentown had it. Not us. Then on Wednesday, Comcast lost the HD feed in our market for another Sabres-Islanders game, replacing it with the Kingsford Barbecue Championship Series. If we want to watch the Food Network, we would. We want hockey in HD. Not grilled lobster and steak. Versus joined the second game (Predators-Sharks) in progress after running a lame note across the bottom of the screen saying the game was "not available" in this market. The entire Versus experiment on Comcast has been a monumental disappointment, starting with the fact so many viewers still remain unable to get the channel. ESPN failed to show the NHL respect in the final year of its TV deal. No argument there. But at least ESPN showed the games. It's time to pull the plug on Versus/Comcast and give it to a network that cares about the game. At the very least, get some people in there who understand how to present the game without alienating the fan base.